I just couldn’t resist doing it again, after my GF Vegan Chocolate mug cake I knew I had to try and make a banana version. Well it is me after all and banana is my food obsession. So after a little experimenting I have come up with a recipe that will give you a perfect individual serving of banana heaven. So lets get on with this Gluten Free Vegan Banana Mug Cake. 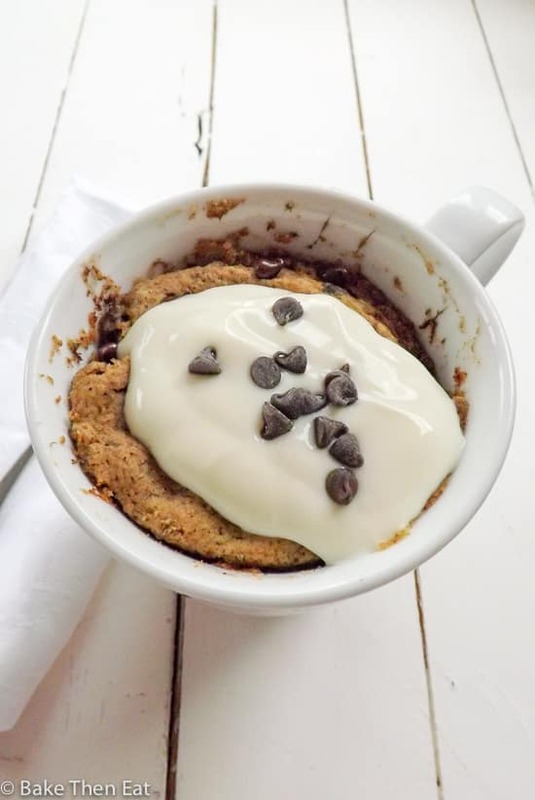 Why a Gluten Free Vegan Banana Mug Cake? It’s strange but I find it easier and far tastier to make mug cakes vegan. Maybe it’s because its a small portion and therefor you are not having to compensate too much for the lack of eggs, unlike larger bakes. It’s the same with making these individual treats gluten free, because they are small you can get away with using a gluten free flour. I like to use rice flour as its light and keeps the cake fluffy. But I do have it on good authority that my last mug cake worked really well with cake flour. If you do not have any cake flour do not panic, all it is, is a 2:1 ratio of plain (all purpose) flour and cornflour (cornstarch). 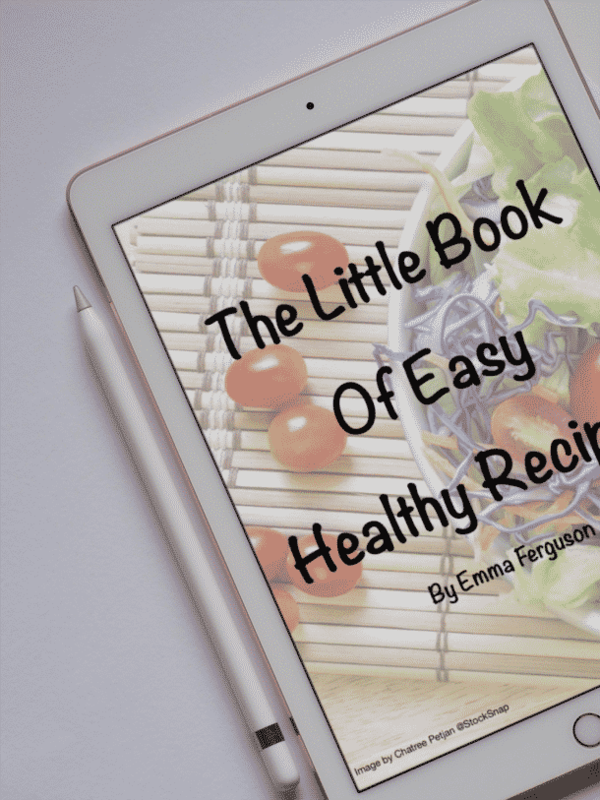 So this recipe calls for 4 tablespoons of rice flour so you would need 2 and 2/3rd’s tablespoons flour and 1 and 1/3rd tablespoons of cornflour. Make sense? The reason I recommend cake flour over just plain flour is because rice flour is fine and very light, keeping this cake super soft and fluffy. And cake flour does the same with other cakes, but I am sure just plain old regular flour would be just fine if you want to use just that. But I do recommend using rice flour if you can. As for keeping it vegan, I am eating more plant based meals at home and am definitely trying to improve on my vegan baking. I also just find it so much easier when making such a small amount of batter to keep it vegan. When I have tried to use eggs in mug cakes I find I have too much batter and there is just major overspill from the mug in the microwave. But fear not, there is nothing overly weird in here that makes it vegan. I use a plant based natural yogurt and almond milk. If following a vegan diet is not a priority for you then just use a cows milk natural yogurt and milk. Same with the mini chocolate chips I use, mine are vegan but use regular if this is not an issue for you. 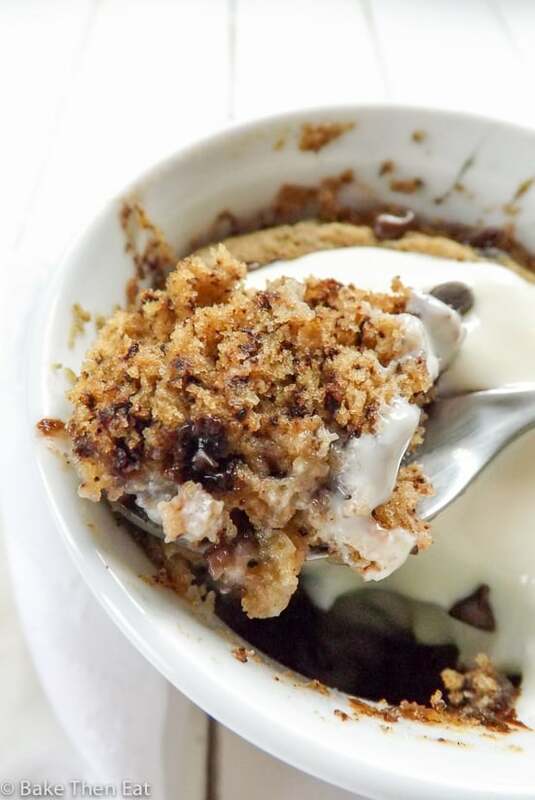 The chocolate chips are completely optional, highly recommended but optional all the same. I used mini ones but they are not always easy to come by in the UK, especially vegan ones. So use regular sized one if you want. I just like the mini ones, especially for a small recipe like this one as I feel they distribute a little better but use what you have available to you. Or leave them out all together. This gluten free vegan banana mug cake is a real little treat, banana cake from ingredients to tummy in around 8 minutes. And it still amazes me just how good these little microwave wonders are. The sponge is soft and fluffy and the flavour is intense enough to be satisfying but definitely not overpowering. The chocolate is a lovely little complimentary flavour as well. 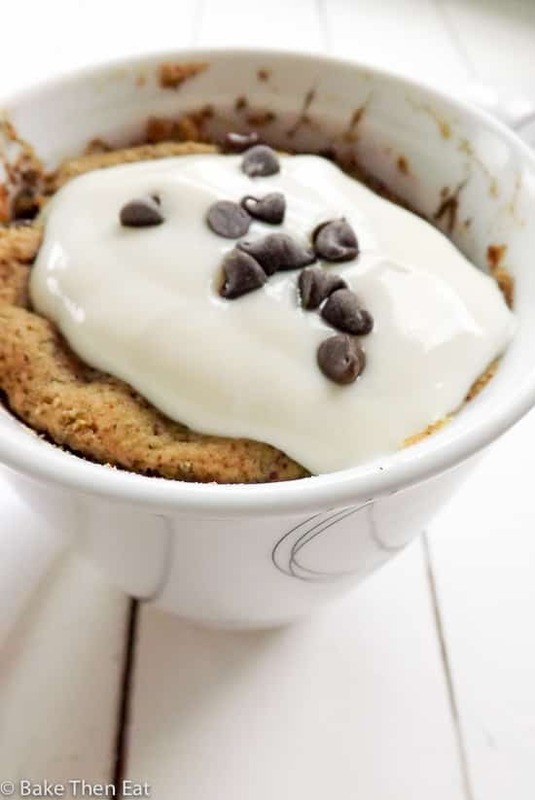 Just a quick word about the sweetness of this gluten free vegan banana mug cake, its not overly sweet. I like it that way, so when I was devouring one at 9am I didn’t feel very guilty about it. 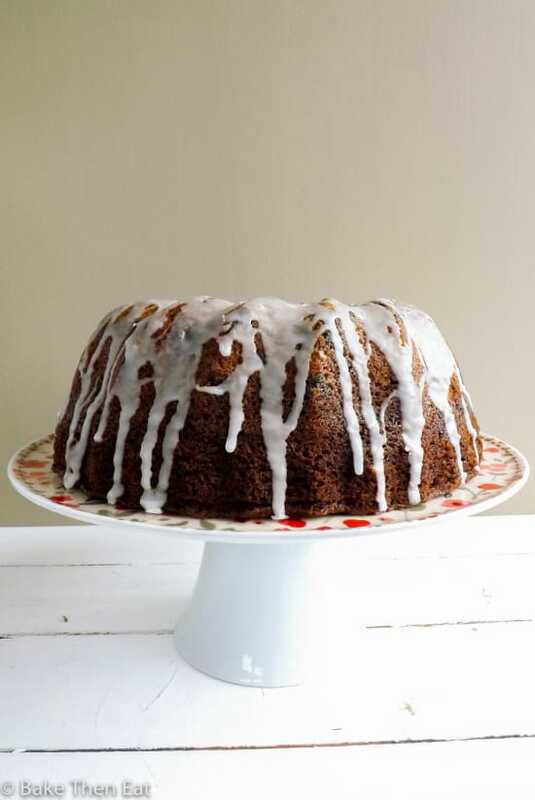 It does have 2 tablespoons of light brown sugar in it, you could up it to 3 or 4 if you prefer a sweeter cake. Or replace the sugar for maple syrup if you want something that isn’t processed. But you will need to experiment, I haven’t tried it but let me know how you get on. The chocolate chips will add a little sweetness as well if you decide to use them, I used a dark semi-sweet chocolate but you could always use a milk chocolate if you wanted to up the sweetness even more. 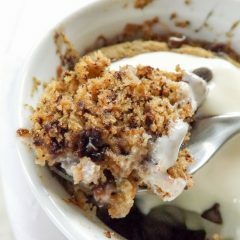 Gluten Free Vegan Banana Mug Cake, is a light and fluffy banana sponge dotted throughout with dark chocolate chips. Made in the microwave so its ready in minutes. Very lightly grease the inside of a large mug with a little cooking spray or a dab of oil. Either in a small bowl or in the mug directly, mash the banana up as much as you can. So there are no lumps left in it. Add in the yogurt, sugar, vanilla and milk and mix until everything is well combined. Then add in the rice flour, baking soda and ground cinnamon and mix till you have a smooth batter. Take the mug cake out of the microwave and let it sand for 90 seconds, then if you want to add a large dollop of yogurt on top and sprinkle a few more chocolate chips over the top as well. Best eaten fresh, but can be made a few hours in advance if you need to. The vegan yogurt I used was coconut based so had a slight coconut flavour to it. This did not impact the over all flavour of the cake. So any natural or plain vegan yogurt can be used.I used almond milk but any plant based milk should be fine.If keeping it vegan is not an issue feel free to use cows milk and yogurt. Also regular dairy based chocolate chips can be used.If keeping it gluten free is not an issue I recommend cake flour be used as a substitution. 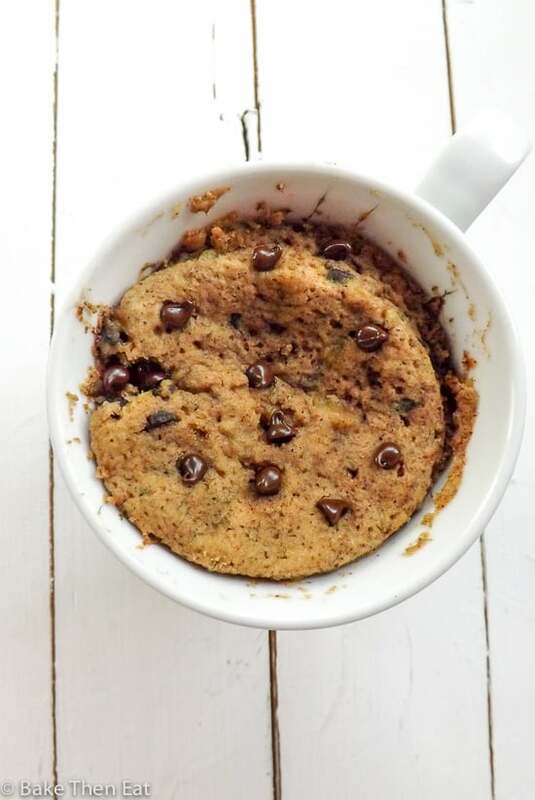 I love the texture of this mug cake – looks delicious! Mine can be a little hit and miss. I’ll give your recipe a go, the combination of dark chocolate and banana is a favourite of mine! Hi Krys, thank you. They can be hit and miss at times, but I found going vegan and gluten free a really good way of getting them perfect. I’m yet to perfect one with an egg base! Looks so moist and delicious. 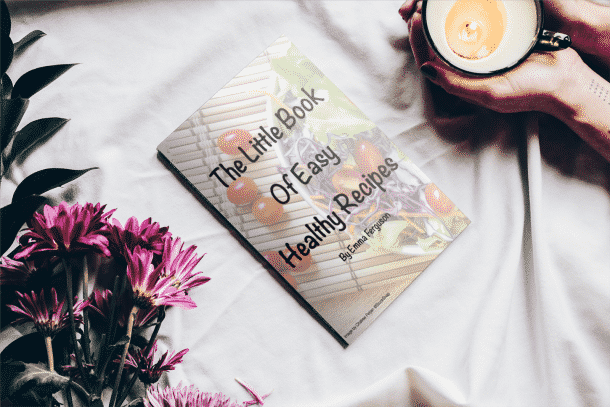 Love the recipe. YUMMY! I’ve been experimenting with a chocolate mug cake! Once I get that one perfected, banana won’t be far behind!!! Hi Liz, I found chocolate easier than banana but I think my next attempt may be coffee, I haven’t had coffee cake for ages! Hi Anu, thank you 😀 Hope you have a great weekend too! Oh wow I’m not vegan or gluten free but this sounds and looks great. Can’t wait to try it sounds so simple. I love the light, moist and soft texture of this mug cake.